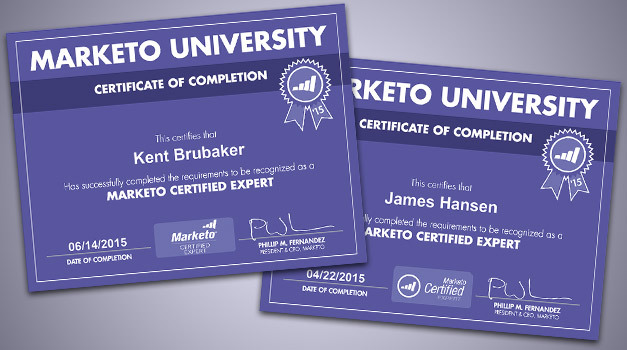 Recently, two of our team members, James Hansen and Kent Brubaker, took the certification exam to become Marketo Certified Experts. What is Marketo, you ask? In layman's terms, it's a fantastic marketing tool that helps us create and manage client email marketing campaigns. Marketo is much more robust than your average email marketing software; it gives us the control to be highly accurate in our deployment of email, and it gives us tons of information on its effectiveness. In short, it helps make sure our campaigns are reaching their goals. Marketo certification is awarded after proving you have extensive knowledge of all the ins and outs of this powerful tool. The certification also gives our clients a high level of confidence that we know what we're doing. When the idea of becoming Marketo Certified Experts was first discussed, James and Kent accepted the challenge without hesitation. Little did they know that this process was going to be a little like going back to school. The qualifications were quite steep, so they decided to attend an overview webinar sponsored by Marketo to gain some insight into what the exam would cover and to see if they were really up to this challenge. They found out that they would each have 90 minutes to complete the 90-question test. So, with only 60 seconds to answer each question, they had to know their stuff. And if that wasn’t enough pressure, the minimum score required for passing the certification exam was 80%. The exam was supervised by a third-party service that takes the security and integrity of the testing process very seriously (as they should). Security measures included monitoring each test taker via webcam, comparing the test taker's face to a digital photo, and comparing his or her keyboard keystrokes to a previously submitted sample. Passed! Big sigh of relief. We congratulate them both on a job well done. Visit our email marketing page to learn more about the email marketing services offered by Street Level Studio.